Leslie and Jose are high school sweethearts, from a small town where everybody knows each other. He proposed on Valentine’s Day during a vacation. Up until that point they had been dating for 6 years and had talked about it before, but she was completely surprised when he proposed. Leslie said the ring was everything she had always wanted. They decided on a destination wedding because they wanted a big wedding without a big price tag. A friend of Leslie had attended a destination wedding in Cancun and the couple realized that Mexico would be the perfect spot. They knew they wanted to get married on the beach. Together with their Destify agent Meghan they sorted through resorts until selecting the Iberostar Paraiso Del Mar. 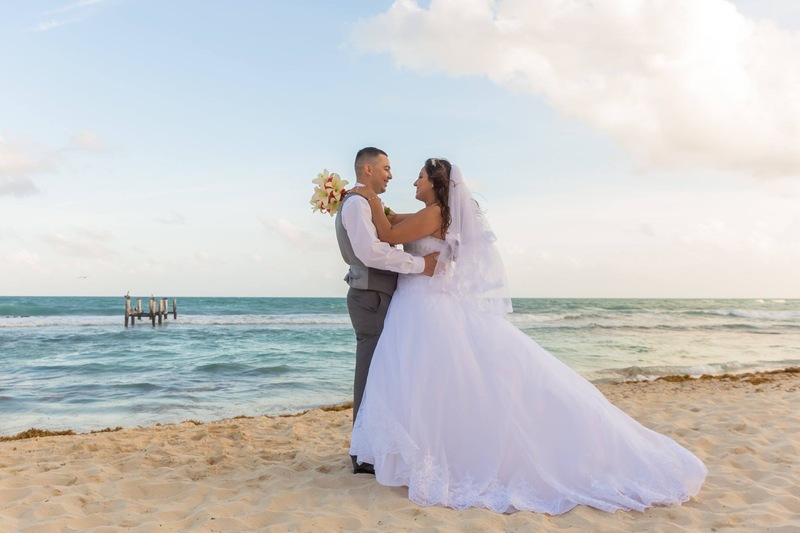 The beautiful Playa del Carmen resort was perfect for their budget and because of the location, Leslie said, “It was just meant to be.” The couple also found that their wedding coordinators were highly responsive, through email or text messaging. Working with them was a great experience, there was never any hesitation in their communication. After their gorgeous sunset ceremony on the beach, they hosted a dinner afterward at the resort’s Brazilian steakhouse. They paid extra for the resort’s photographer who captured the ceremony and dinner, where the couple cut their cake after everyone ate. The rest of the trip was simply a wonderful vacation for the couple and their guests. Leslie’s advice for future brides is to just go for it, that destination weddings are the least stressful way to get married. The couple cites that you don’t have to worry about any of the preparations. She is even recommending it to her recently engaged friends. It’s the best way to enjoy your family and getting married.